The LINC (Laboratory INstrument Computer) was designed in the end of 1961 by Wesley Clark and built in the beginning of 1962 by Charles Molnar and others (Wesley Clark designed the logic, while Charles Molnar did the engineering) at Lincoln Laboratory of MIT, Massachusetts, and eventually launched by Digital Equipment Corporation (DEC) in March, 1962 (see the lower photo). 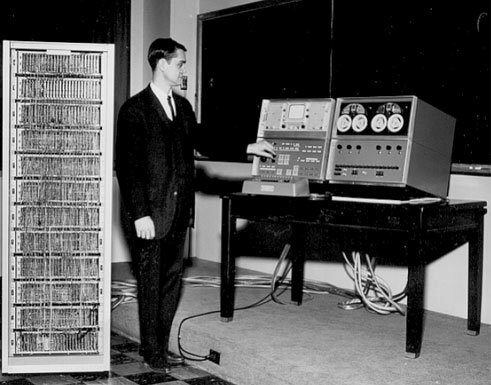 With its digital logic and stored programs, the LINC is accepted to be the first interactive personal computer in the world. In 1961 Wesley Allison Clark (1927-2016), an electrical engineer at Lincoln Laboratory of MIT, who had contributed substantially to the development of the large TX-0 and TX-2 computers, ordered by US Navy, realized that time sharing, used in these highly advanced machines, is not the only solution to the problem of direct access. He proposed building a relatively inexpensive, general-purpose computer that could be controlled easily by biomedical researchers. Initially ignored by Lincoln Lab's management, Clark continued to work on his idea for a small computer. He disappeared from the Lab for about 3 weeks in the end of 1961, and returned with a complete design for a small computer, with characteristics that marketing representatives would later call user friendly. 4. To be able to process biotechnical signals directly. 6. It must cost at most $25,000 (this was the amount a lab director could spend without higher-level approval). LINC originally had one kilobit of core memory (1024 words), which was expanded to 2 Kb later. It was designed for interactive use via Graphical User Interface, with a 256 x 256 CRT display and four knobs (the equivalent of a mouse in those days) to enter variable parameters. The Soroban keyboard, for alpha-numeric entry, has keys which lock down when pressed, and pop back up when the computer has read them, thereby solving the problem of type-ahead! Removable media was two LINC tape drives — the predecessor of DEC tape, each spool holds 512 blocks of 256 12-bit words, or 512 bytes—the characters (upper-case, plus various greek and math symbols) fit into 6 bits. The standard program development software (an assembler and screen editor) of LINC—so called Assembly Program (LAP), designed by Mary Allen Wilkes, was integrated with the Assembler and File System and was written for users, not computer professionals. LAP made it fairly easy to program LINC for biomedical experiments and, in its last version, was sufficiently flexible to allow for word processing. A typical configuration of the machine (see the nearby image for one of the prototypes in MIT) included an enclosed 6'X20" rack, four boxes holding tape drives, a small display, a control panel, and a keyboard. Analog inputs and outputs were part of the basic design. In these, the tall cabinet sitting behind a white-Formica-covered table held two somewhat smaller metal boxes holding the same instrumentation, a Tektronix display oscilloscope over the "front panel" on the user's left, a bay for interfaces over two LINC-Tape drives on the user's right, and a chunky keyboard between them. Linc was manufactured commercially by DEC (starting in 1964) and Spear Inc. of Waltham, MA. A total of 50 were built, most at Lincoln Labs, housing the desktop instruments in four wooden racks. The first LINC included two oscilloscope displays. Twenty one were sold by DEC at $43600 (a bargain at the time). When a scientist sat down at the LINC keyboard, he had at his disposal a complete and comprehensible computer system. He could create a program and execute it in one sitting. Perhaps most elegantly, as the data were displayed an experiment could be tuned instantly by turning a knob hooked to an analog-to-digital converter. What sixth graders now take for granted was a remarkable achievement which led recently to a "computer pioneer" award to Wesley Clark—by the IEEE (Institute of Electrical and Electronic Engineers), which acknowledged Clark as the designer of the first personal computer, Eckert-Mauchly Award and membership to the National Academy of Engineering. Wesley Clark had a small but key role in the planning for the ARPANET (the predecessor to the Internet). He suggested to Larry Roberts the idea of using separate small computers (later named Interface Message Processors) as a way of standardizing the network interface and reducing load on the local computers.